Make a shortcut of client.exe in to your desktop. PS. : WindBot does not work on game servers actively protected by BattlEye. It may, or may not work on these servers in the future. Last edited by Imba; 07-27-2017 at 12:11 PM. You must attach WindBot BEFORE logging in to the game. We only have Fast Hotkeys, CPU Saver and SSH Tunnel. We no longer have Chat Togglable and Use Custom Config Files, for obvious reasons. Reworked the whole hotkeys system, so it can work with any shortcut on your keyboard. It can even attack creatures using hotkeys (if you have it set on your settings). servercount(itemid, ignoreequips) - will tell how many items of id itemid you have on your inventory (even with closed backpacks). If you pass true to ignoreequips it won't count your equipment. depotcount(itemid) - will tell how many items of id itemid you have on your depot. You must open market before using this function! gettool(tooltype) - returns the itemid for tooltype, where tooltype can be 'rope', 'shovel', 'machete', or 'pick'. It will always prioritize the item you chose in Cavebot, if available, otherwise it will pick any available, or 0 (if no tool was found). cloudmessage(message) - will send a message to WindCloud, which will be displayed in your character's profile. .learned - returns true if your character have already learned this spell, false otherwise. $hasservercount - returns true if the server you are playing at supports servercount(...), false otherwise. Last edited by Lucas Terra; 12-05-2016 at 02:18 PM. Fixed useitem(...) not working without an itemid. Fixed useitem(...)/openitem(...)/useitemon(...) not using contextmenu if a creature is around. Fixed openitem(...) not working when opening an item on ground with context menu. Added $hasservercount, return true if the server supports servercount(...), false otherwise. Fixed smartscreenshot(...) not drawing equips correctly. screenshot(...) only works if client is running on DirectX. I'll make it work with OpenGL later. Fixed a bug where Special Areas wouldn't get applied when trying to get inside a house. Fixed moveitems quickly not working. Fixed buyitems(...)/sellitems(...) scrolling too fast, causing bot to purchase/sell wrong items. moveitems(...) can now hold Shift to move single stacks. moveitems(...) now works with or without 'Press CTRL to Drag Complete Stacks'. Moving full stacks without holding Ctrl is faster. Bot will now warn you if you don't have classic controls enabled. Bot can now open your store inbox. Fixed bot adding bodies to loot queue wrongly. Let me know if you still get false positives. Fixed a bug where positions would be written/read wrongly, causing all kinds of weird behaviours in cavebot. Fixed Targeting walking. Please make sure your client's keyboard delay is between 0 and 100 ms (I will add a warning about this later). Your $balance will now update from trade lists if you're premium account. Fixed trade list ordering wrongly if you don't have 'sell equipped' checked. Fixed refillammo not working on belt destination. Added gettool(tooltype). It returns the itemid for tooltype, where tooltype can be 'rope', 'shovel', 'machete', or 'pick'. It will always prioritize the item you chose in Cavebot, if available, otherwise it will pick any available, or 0 (if no tool was found). Fixed a bug where getcontainer(...).isopen was returning true when it wasn't actually opened. This was causing issues in Looting, making it take too long to detect an open window. Healer will no longer try to cast spells you haven't learned. Healer Widget will now give you more info about the spells it can't cast. It will draw some small letters informing you about the spell status. 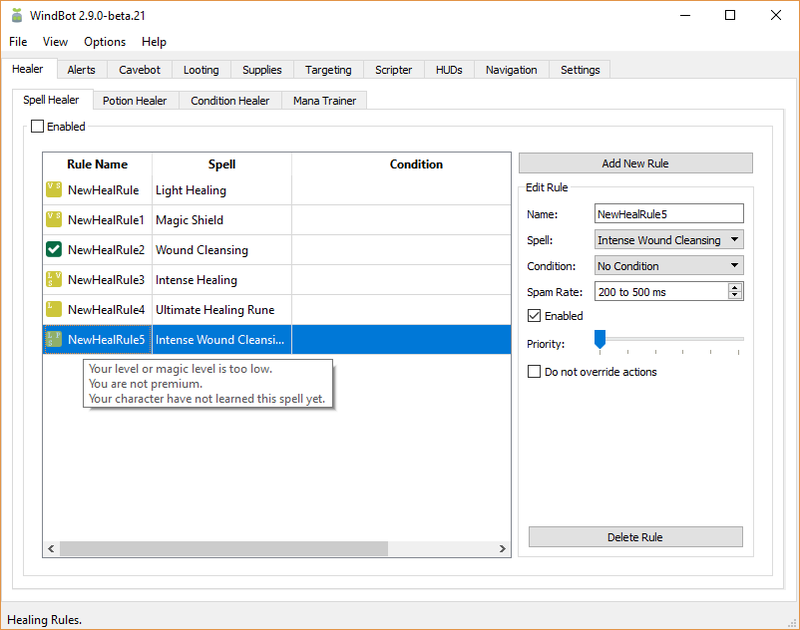 You can also hover your mouse at the spell rule name and it will show you a tooltip (like shown in this image). Updated to latest client build. Fixed group cooldowns. This should make healer as fast as it was in gameclient 10. Now your $balance will be updated when you buy items using your bank balance. Cavebot will no longer spam rope, or shovel. It will wait a random time before retrying. Fixed effects, projectiles, animated texts' Lua types. Added cloudmessage(msg), which sends a message to WindCloud that will be displayed in your character's profile. servercount(...) now accepts a 'ignoreEquips' boolean parameter. The function's signature is now: servercount(itemid, ignoreEquips). Fixed some connect(...) / reconnect(...) issues. Fixed $connected returning true before actually being connected to the game. Fixed an issue with moveitems(...), browsefield(...) and navigating through containers with client minimized. You need to update your WindAddons too! $balance will return -1 if it hasn't been updated yet. Fixed bot crashing in some situations. Fixed NPC Trade and Market not selecting the correct item index. Fixed xlog() crashing the client. Added support for client build 11.02.4171. Fixed a walking bug when changing floors. An update to WindAddons is required. Added $sessionexphour, which shows the exp rate average since you logged in. Fixed bot not looting tortoises and pirates properly. Updated items.xml and creatures.xml. I will push this later to WindBot 2.8.x. Fixed equipitem(...) not using hotkey for two handed weapons. Fixed bot crashing for some characters. Added .equippedid property to iteminfo. It uses info from items.xml, and right now only rings have this property. If this property is not set, it will return the item's id. Fixed bot getting CTRL/SHIFT keys stuck under some situations. You must update your WindAddons too. You should be able to use 'Birthday Backpack' as a looting destination now. Removed unused options from WindAddons UI, to avoid confusion. Fixed bot not being able to attach. Added support for Client Version 11.04.4366. Fixed openbattlelist() not opening if the buttons are minimized. It will also try to open with a hotkey if it's a single key hotkey (or Fast Hotkeys). Fixed scrollbars not being scaled correctly on high dpi systems. Added support for Client Version 11.04.4384. Fixed file incompatibilities on version 11.04.4384. Added support for Client Version 11.04.4391. Added support for Client Version 11.10.4427. Added support for multiple sidebars. Fixed Walk With Map Clicks not working in High DPI Displays. Bot is now able to use Alt+<some key> hotkeys. As well as any combination of Alt, Shift and Ctrl. WindAddons' fast hotkeys will now always work, even if you're holding Alt, Shift or Ctrl. Fixed bot not being to use the NPC Trade window. Added support for Client Version 11.10.4445. Fixed a WindBot crash when attaching to a client with WindAddons. Fixed client crashing when using FastHotkeys (happened very very rarely). Some other bugs related to FastHotkeys. WindAddons for client 11 and client 10 can now be used simultaneously. Fixed tilereachable(...) not working correctly. Fixed client getting stuck when "Alt+Tabbing". Added support for client 11.10.4472. Added support for client 11.10.4527. Added support for client 11.10.4562. Added support for client 11.11.4601. Added support for client 11.20.4691. This version ignores the anti-cheat. Use it at your own risk. Added support for client 11.21.4812. Now your tools (shovel, rope, etc.) will be saved/loaded automatically to your character's database. Same for looting destinations. Added support for client 11.30.4876. Added support for version 11.30.4898. Added support for version 11.30.5000. Added support for version 11.30.5036. Bot will now click on 'Centre Map' if the minimap position is not centered. Fixing issues with walking with map clicks and switching floors. Bot will now press 'Esc' if you get a 'Connection Lost' message. Fixing issues with reconnect. Added support for version 11.31.5149. Added support for version 11.32.5206. Added support for version 11.32.5229. Added support for version 11.32.5246. Added support for version 11.32.5287. Added support for version 11.32.5341. Added support for version 11.34.5384. Added support for version 11.34.5388. Added support for version 11.40.5409. Fixed a problem with bot not recognizing the trade window correctly. Bot now automatically adds 2 seconds cooldown to attack spells when changing floors (like it was in Tibia 10). Added support for the new conjure spells and summon spells. Fixed crash on context menus. Fixed market not identifying the buy/sell/anonymous buttons state in market. Added support for version 11.41.5435. WindBot now protects the client from crashing, and prints an error saying what caused the crash, which you should report here on our Forums to help us fix it quickly. Added a 'lootBodies' property to creatures.xml, which lets you specify the body ID for the looting system to pick up. Updated 'items.xml' and 'creatures.xml' with the latest data. Added support for version 11.43.5504. Added support for version 11.43.5516. Added support for version 11.45.5528. Added support for version 11.46.5537. Fixed walking with arrow keys not working if client is not focused. Added support for version 11.46.5556. Added support for version 11.47.5602. Added support for version 11.47.5620. Added support for version 11.47.5640. Added support for version 11.47.5674.